The portrayal of women warriors in literature and popular culture is not something that is entirely fictional – they stand as ordinary citizens among us, such as ONE Atomweight World Champion Angela Lee, 8x BJJ World Champion Michelle Nicolini, and the UFC’s Joanna Jedrzejczyk. Perhaps calling those World Champions ‘ordinary’ isn’t exactly correct, so let’s go ahead and call every woman, including you and I, who trains martial arts to be extraordinary; a warrior and an overall badass. 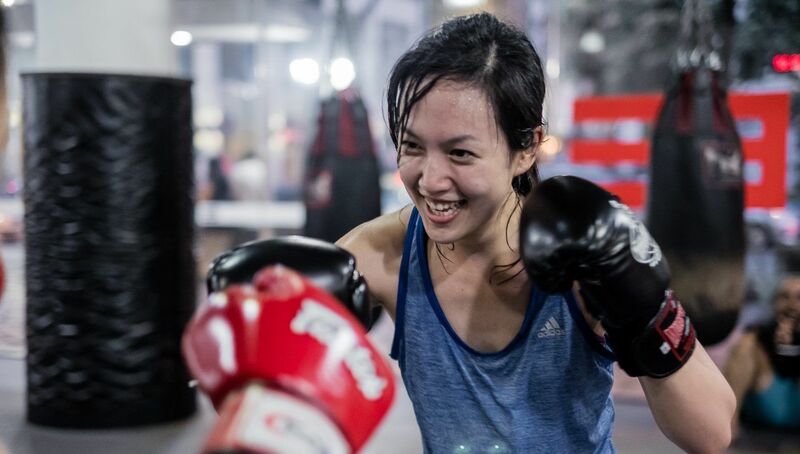 To explain what we mean, here are 4 reasons why you become an extraordinary, empowered woman when you train martial arts. Martial arts empowers women with confidence that they carry out the doors of the gym with them every time they leave. This confidence is built from how the instructors interact with you and the new skills you learn in every single class. In martial arts classes, you are encouraged to speak up if you do not understand a technique, or if you want it to be demonstrated again. Your instructors and peers will be respectful of your question, even if it seems like everyone else already understands. More importantly, you learn how to defend yourself in a multitude of situations – through effective striking in Muay Thai, or a solid ground game where the opponent’s size doesn’t matter in Brazilian Jiu-Jitsu. Knowing how to defend yourself, even if you have never been in a position of danger before, gives you an extra ounce of confidence and spring in your step, knowing that you have skills that could protect yourself, your family and your friends. Speaking up and being heard is not only useful in the gym, but women will bring it with them to the boardroom. Now is as important a time as any for women to break through glass ceilings and become heard and acknowledged in every profession. Martial arts is how you can break stereotypes and a place where you are able to hone in the confidence you need to succeed in your career and continue challenging the norm of ‘equality’. When you train martial arts, you not only become physically stronger, but mentally as well. The physical aspect comes without question. Each class will have you push your physical limits further than the last, and you will not realize the small physical changes happening within your body until you look back at photos of yourself 6 months later and be genuinely surprised at the differences you see. Not only how strong you look, but the extra glow you exude from the mental strength you have gained as well. Strength isn’t only about how many pounds you can lift in the gym or who you beat in an arm wrestle but about what you can tackle and conquer in everyday life. We all need a strong mind to face everyday challenges and solve problems, and just like the body, the mind can also be trained. A strong mind is what we use to help push ourselves that extra bit further; it keeps us focused on our determination to succeed in whatever we do. Martial arts requires discipline and focus to complete complex techniques. Due to this style of training, you learn how to control your emotions due to set backs and disappointments when it takes more than a few tries to learn a new concept. It can teach you how to be persistent and control your desires to give up. Being mentally strong is so powerful in your everyday life – helping you stay calm when work or home becomes stressful. You can burn up to 1,000 calories in a 60 minute Muay Thai training session. In a world where social media is selling the ideas of 6 pack abs and quick fix bikini body workouts, it is important to acknowledge that some things we see in the digital world are far from reality. Every body type is different, and self-consciousness stems from feeling great about yourself and celebrating your individual beauty. There is nothing more real than stepping into a martial arts gym. An environment far from clear blue oceans and leafy palm trees, you are surrounding yourself with other people who are there to work hard, improve themselves, and unleash their greatness. You will be respected not for owning the latest fashion trends, but for turning up repetitively, making it known that you want to be there. Of course, you will become fitter when you train martial arts, but there is something more appealing than mere physical appearance when you are half your opponent’s size and can armbar your way into a submission. Women warriors have an image of their own, and self-consciousness plays little part. Part in parcel of being a woman warrior is to inspire other women, and to one day inspire our children and have them walk in our footsteps before forging their own. The more women there are in martial arts, and the more smiles of encouragement we can give the females who are stepping onto the mat for the first time will result in more female training partners and friends we will have on our martial arts journey. It sets the precedence for women of the future too – for our daughters. I want to inspire my daughter, to let them know that if they find the upcoming Mayweather vs McGregor fight entertaining, that it is okay to feel that way and that it is okay, to play with Barbie Dolls and makeup, but to want more too. Martial arts is an avenue for women to break social stereotypes. Gone is the the time where physical activities are ‘for boys’ only. Gone is the time where certain CEO roles are for ‘men only’. Martial arts is about women empowerment, bringing out the warrior within, and teaching fun and exciting skills that women wouldn’t learn elsewhere. It will also give people a reason to second think challenging you. Give it a go and be extraordinary with us.